Eilert Smith is an exceptional new hotel in Stavanger - home town of Odd Standard. Named after its architect, this 1937 building is a prime example of Norwegian functionalist architecture. Now housing a boutique hotel of 11 rooms, they wanted tableware that matches the aestethics, history and feeling of the building and rooms. 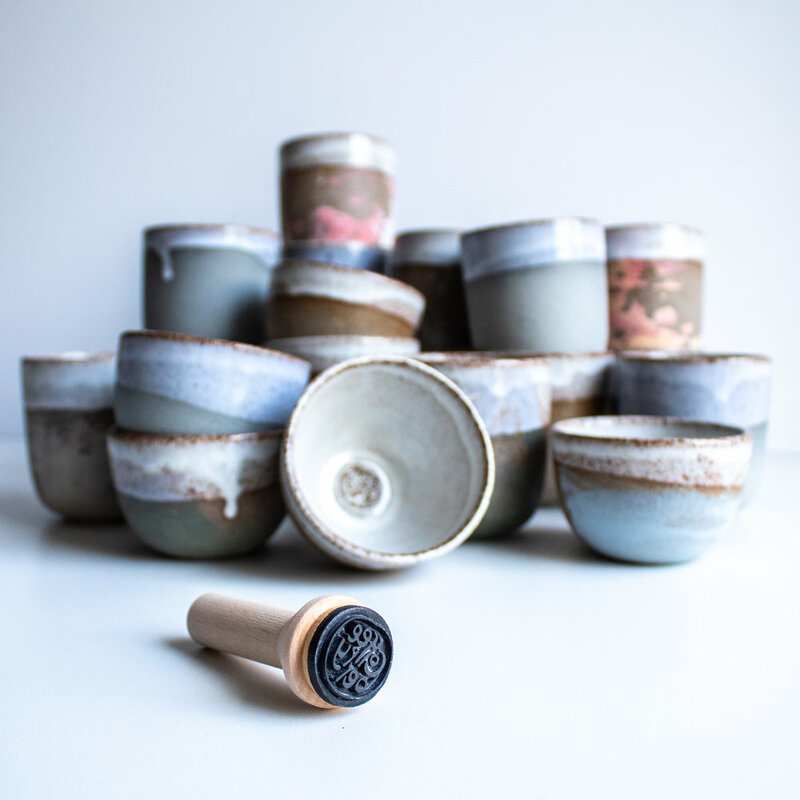 The tableware is made from strong off-white clay, and most of the items have a black stripe near the edge, and a logo stamp. Since all the items are handmade, there are individual differences that give character to the products in themselves and as a group. We made some nice handles for our Kuppi cups. The stripes are applied with a thin layer of black clay, by hand. All the products for Eilert Smith are made in the microfactory. The tableware for Eilert Smith consists of our Soft Curve plates in three sizes, our smallest Bowler, a low-cut version of the big Bowler, Kuppi with a handle and tea cups (not pictured). When developing the tableware for Eilert Smith, we tested various colours of clays, glazes, stripes and stamps before deciding on the chosen off-white clay with transparent glaze. The first restaurant in Norway to get a Michelin star outside of Oslo, Re-naa in Stavanger is in a class of their own. They recently reopened in a new location, which offered some nice challenges for us to work on. Ceramic beetroots, hotpots with handles and handpainted cups! Ceramic beetroots made from red stoneware clay with a violet glaze on the inside. It is always a challenge to make ceramic objects with high precision; this is why we fire the top and bottom together to avoid deformation. Flower containers made from very rough clay. The ball-like objects have some small and some larger holes to offer flexibility when it comes to flowers. Collaboration with Stilken & Strøm. 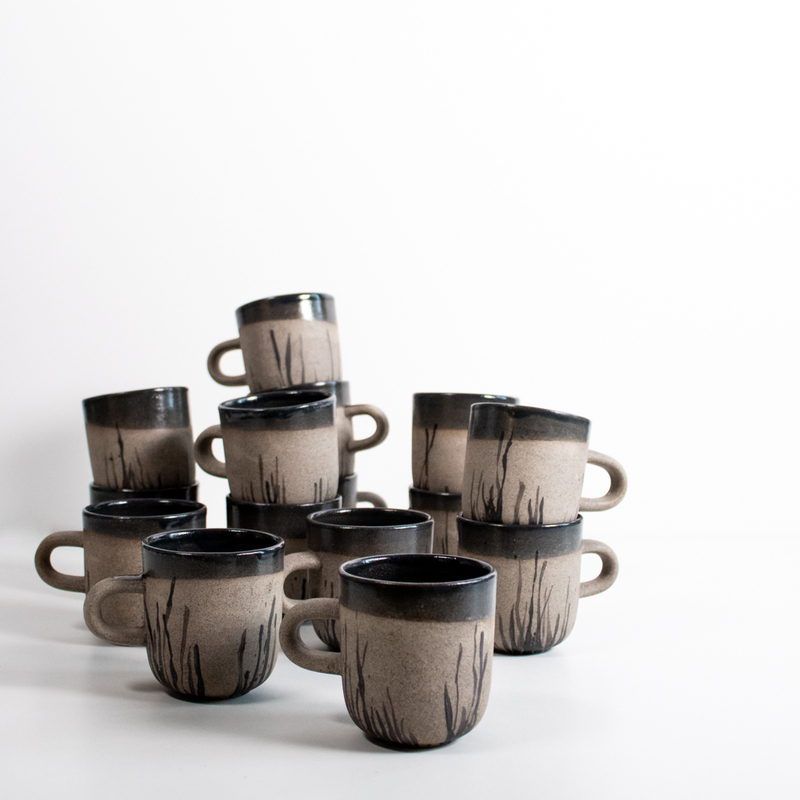 The cups are made from a rough clay and handpainted with ceramic underglaze colour. In our microfactory we fire each ceramic object twice - the first time to 1000 degrees celcius and the second time (with glaze) to either 1245 or 1275 degrees. The hotpots are glazed on the inside of the bowl part and the outside of the lid part. We developed a new plate for the reopening of Renaa. It is based on our Semi/26 plate, but with a defined centre and a wide rim. This version also has a relief (physical pattern) on the rim part. The difference in colour between the centre and the rim comes from the amount of glaze - in this case more glaze gives a whiter colour. Coffeeberry is a small group of high quality coffee bars in the Stavanger area who came to us with the idea of creating a kit for their precision brew coffee. We developed a new jug and gave our Kuppi cups (black coffee) and Bowler 7,5 cups (espresso) a distinctive look with a mix of pastel colours on rough grey clay. The Coffeeberry logo is embossed on the inside of the cups, making it visible yet discreet. The jug for precision brew was designed to work with both smaller and larger volumes of coffee, up to a maximum of 5 dl. The Coffeeberry logo is embossed into the clay when still wet, It is placed inside the bottom of the cup, making it gradually more visible as the guest finishes her coffee. The special edition Coffeeberry Kuppi’s are availble for guests to buy from the coffee bars. The plaster moulds in the background are used for making the cups. The jugs match the cups with their mixed pastel colours on rough grey clay. Restaurant Rest. 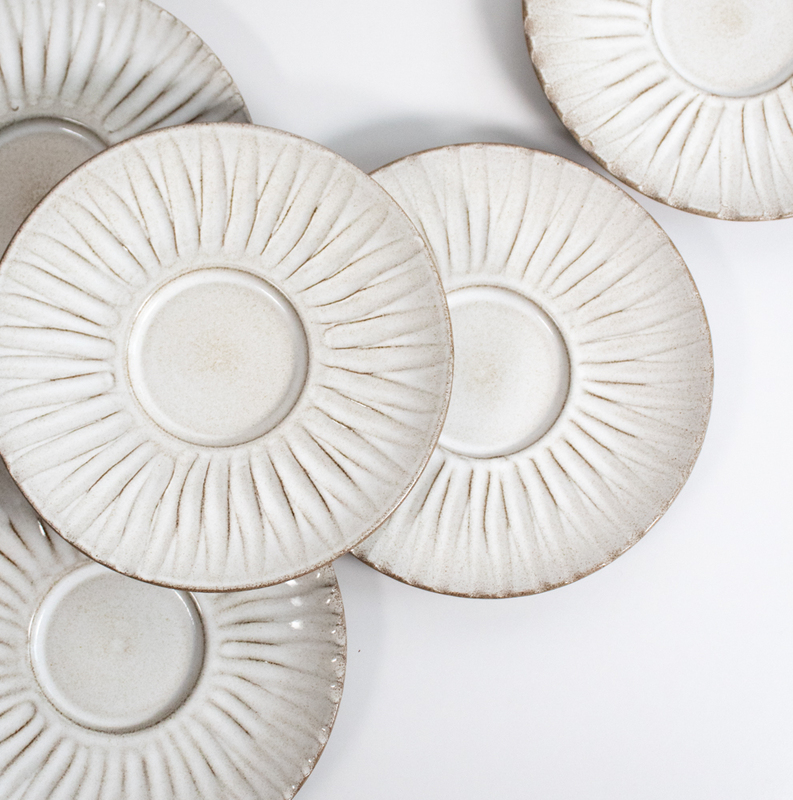 (Oslo, NO) has a strong focus on food waste and wanted tableware that enhances their philosophy. We designed and developed a range of products using recycled glass, left-over clay, oyster shells and chicken feet. The glass products are manufactured by glass studio Formbar, in collaboration with Sirkel Glass. Most of the products for Rest. are made from 100 % recycled glass, some from clear glass and some from a mix of recyclable coloured glass called green mix. Our 28 cm plate ALMOST FLAT, made from a mix of left-over clay from our microfactory. Mixing clays is a potentially problematic venture, as it creates tension which sometimes lead to cracking during firing. We developed the technique and clay mix ratio to be able to control this. Bowls (17 cm) made from a mix of left-over clays; sand-coloured and spotted clay. 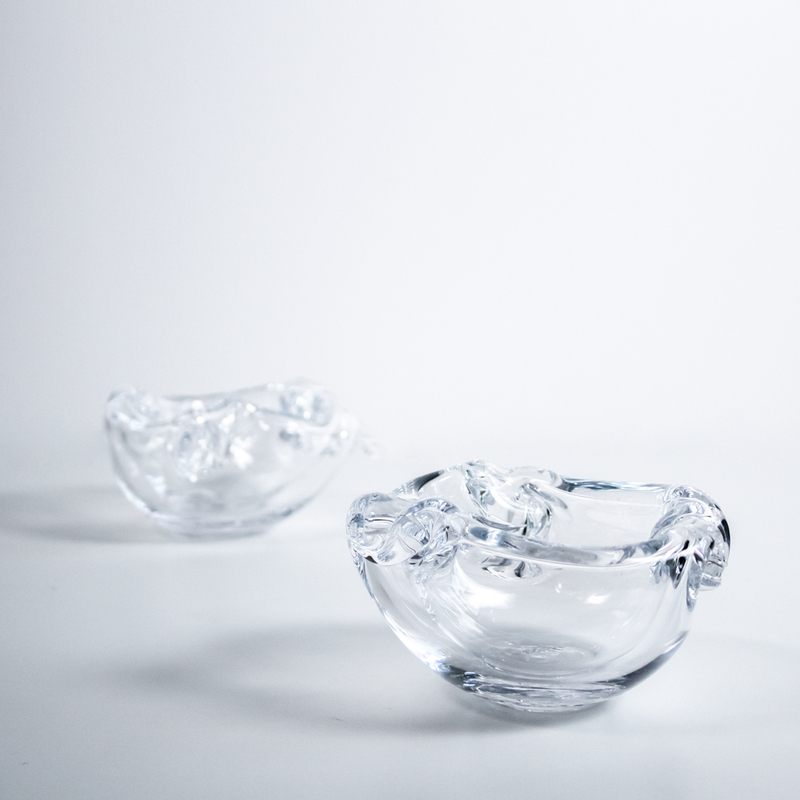 Glass bowl made from 100 % recycled glass. Small rough bowls with crushed oyster shell mixed into the clay before firing and glazing. The most experimental product for Rest. is the plate with real chicken feet. The feet have been dried and treated with a food-safe black coating. During the development of the chicken feet plates we first considered letting the plate stand on feet instead of having the feet point upwards. The oyster shells are dried and crushed before they are mixed into the clay, fired and then glazed and fired again. Halfway through the project we all met at Formbar (the glass studio) and tested all the prototypes together with head chef Jimmy Øien. Small snack plates (12 cm) made from a mix of left-over clays; sand-coloured and blue. Small glass jugs made from 100 % recycled glass in green mix. Sketches is a chef-centered product range that we have designed for RAK Porcelain (United Arab Emirates / Luxembourg). We wanted to create a series of products in the way an ambitious chef creates a meal - like cleverly choreographed theatre and a journey through different emotions, impressions and associations. All the Sketches products are available through RAK and their distributors. The embossed plates have a surface that gives a feeling both of how soft the clay is during the production process, and also of a thick cream that someone has run their fingers through. The Sketches collection is a small collection of products aimed at the ambitious chef. We wanted the products to represent something immediate and honest; to express the materials as they are and not try to imitate something. This bowl has a raw and immediate expression and an somewhat unfinished look - as if the process suddenly stopped. The Sketches collection represents a variety of materials with porcelain as the core. The appetizer tree is made from stainless steel and has a wooden base. The woodstand gives the chef the possibility of serving something that is usually nicely plated in a very different way - lifted from the table. Sketches is not a traditional collection, rather an eclectic mix of materials and visual expressions. Something refined and something rough. Thin and thick. Big and small. From the development; a plaster model of the saucer. The flat plates have a rough edge that was developed partly with experimenting directly in clay. The products are designed so that the finger marks do not conflict with tha plating area. These are clay models from the development. The woodstand is paired with small steel spears that challenge the creativity of the chef, as the function is not obvious. A well composed meal is like a journey through different emotions, impressions and associations. There should be surprise, but also familiarity. Pleasure, but perhaps also melancholy. Interaction, but not too much. Sharing - and the opposite. We have extensive background from design and production of tableware and broad experience covering all phases of product development and commercialization. Contact us to discuss any project, large or small.